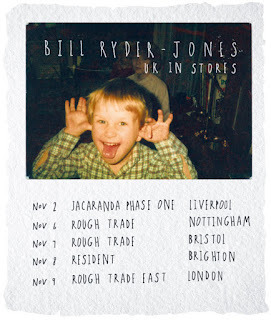 BILL RYDER-JONES has announced an intimate five-date tour across the UK to promote his forthcoming album Yawn. The tour-opener will see Bill visit Jacaranda Phase One for an intimate performance and album signing on Friday, November 2 - Yawn's release date. Bill will then visit Nottingham, Bristol, Brighton and London on his whistle-stop tour across the UK. He is also set to perform his 'biggest' headline gig to date at Liverpool's newly refurbished, Grand Central Hall on Thursday, December 13 courtesy of Harvest Sun promotions. Recording and producing Yawn himself, Bill recruited the help from his friends including The Orielles and Our Girl with vocals and mixing by Craig Silvey. Along with his own material, he was received production credits for other musicians including Our Girl, Hooton Tennis Club, Brooke Bentham and Holly Macve who he records at his own Yawn Studios in West Kirby.